Poly(A) polymerase with ATP (red) in the active site. Most of the RNA found in our cells is built using our DNA genome as a template. In special cases, however, our cells also build RNA strands without a template. For instance, the end of (almost) every messenger RNA strand is composed of a long string of repeated adenosine nucleotides. These long poly(A) tails are not encoded in the genome. Instead, they are added after RNA polymerase finishes its normal process of transcription. After RNA polymerase releases the RNA strand, other enzymes add the finishing touches, editing out introns, adding a cap to the front end, and building the long poly(A) tail at the other end. A complex of over a dozen enzymes oversees the creation of a poly(A) tail on messenger RNA molecules. Several special sequences at the end of the RNA recruit this complex to the proper place. Then the RNA strand is cleaved, and about 250 adenosine nucleotides are added to the new end. The enzyme poly(A) polymerase, in PDB entries 1f5a (cow) and 1fa0 (yeast, shown here), is responsible for the creation of the poly(A) tail. With the help of two magnesium ions, it binds to the messenger RNA and adds adenosine nucleotides one at a time to the end of the strand. The poly(A) tail plays several important roles in the function of messenger RNA molecules. With the help of poly(A)-binding protein (shown on the next page), it protects the end of the RNA strand, shielding it from RNA-cutting nucleases. It also assists with the transport of the messenger RNA out of the nucleus through nuclear pores. Surprisingly, the poly(A) tail, which is at the end the messenger RNA, also stimulates the start of protein synthesis by helping to recruit translation initiation factors at the front end of the RNA. Some researchers actually think that poly(A)-binding protein links the RNA strand into a big circle. This could have a very useful consequence: since the beginning of the messenger RNA is so close to the end, ribosomes that have just finished making a protein could jump immediately to the beginning and start again. Two domains from poly(A)-binding protein bound to a short piece of RNA (orange). Poly(A)-binding proteins bind to poly(A) tails as soon as they are synthesized in the nucleus, and then they chaperone the messenger RNA throughout its life. The protein is composed of four similar domains, which bind to a stretch of about 27 RNA nucleotides. The structure shown here, from PDB entry 1cvj , contains only the first two domains and a small piece of RNA (in orange). Poly(A) polymerase is highly specific for ATP, but it will use this ATP to build a poly(A) tail on nearly any RNA strand. PDB entry 2q66 captures the enzyme in the middle of building a tail. 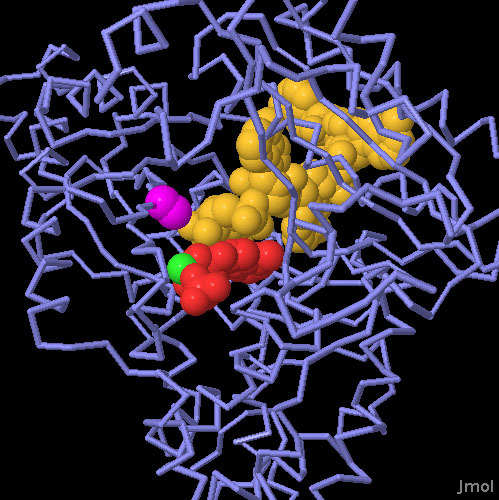 The enzyme is clamped around a short stretch of poly(A) RNA, shown in yellow. An ATP molecule is shown in red, positioned perfectly by a magnesium ion, shown in green. The enzyme in this structure, however, has been mutated so that it cannot perform the reaction. Position 154 is normally an aspartate that coordinates another magnesium ion, which performs the reaction. In this structure, the aspartate has been changed to an alanine, shown in magenta, so the catalytic magnesium is missing. You can click on the image for an interactive Jmol view. 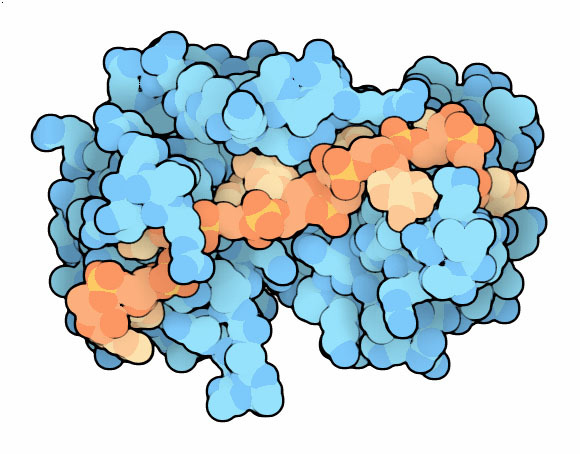 To look more closely at the structural basis of adenine recognition in the active site, take a look at the page at Proteopedia. 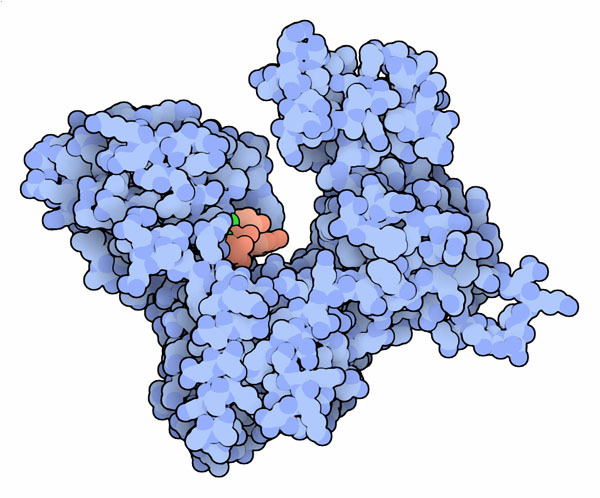 Poly(A) polymerase is highly flexible, opening and closing while it performs its job. For instance, compare the open forms on the first page of this Molecule of the Month with the closed form on this page. Why is this flexibility important, and what structural features of the protein allow it to be flexible? Do you see any structural or functional similarities between this template-independent polymerase and polymerases that use templates, such as DNA polymerase and RNA polymerase? G. M. Gilmartin (2005) Eukaryotic mRNA 3' processing: a common means to different ends. Genes and Development 19, 2517-2521. M. Edmonds (2002) A history of poly A sequences: from formation to factors to function. Progress in Nucleic Acid Research and Molecular Biology 71, 285-389. J. Zhao, L. Hyman and C. Moore (1999) Formation of mRNA 3' ends in eukaryotes: mechanism, regulation, and interrelationships with other steps in mRNA synthesis. Microbiology and Molecular Biology Reviews 63, 405-445.